The Sisters of St. Joseph of Toronto were instrumental in establishing four exemplary healthcare hospitals in the City of Toronto since their arrival in 1851 from the United States. The order was founded in Le-Puy-en-Velay, France in 1648. The Sisters set up hospitals across Canada, with four leading hospitals in Toronto. St. Michael’s Hospital in 1892, St. Joseph’s Hospital in 1921, Our Lady of Mercy Hospital in 1925 and Providence Hospital in 1962 have all set high standards for care in the largest city in the country. The Sisters operated nursing schools in Toronto and Winnipeg. All of these hospitals are now part of the public healthcare system serving the citizens of Toronto demonstrating the Sisters’ belief in caring and nurturing community. Each of their hospitals reflected the time period that they emerged from. commodation suited to varied needs will be welcoming, ecologically sustainable, designed in harmony with nature and with flexibility and potential for diverse use now and into the future.” Project Mission Statement, Congregation of the Sisters of St. Joseph of Toronto, 2008 The Sister’s mission statement mandated an ecological approach to physical, social and economic well-being of all people. 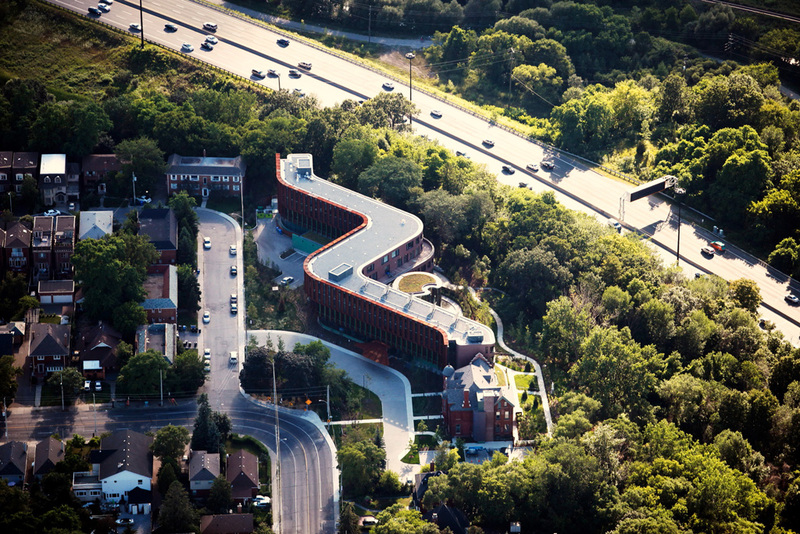 Forming a sinuous line between the Don Valley to the north and the low rise urban fabric of the city to the south, this new home for the Sisters of St Joseph articulates both individual contemplative life and the community engagement of the Sisters ministries, making relationships to Nature and City to reinforce public and private aspects. 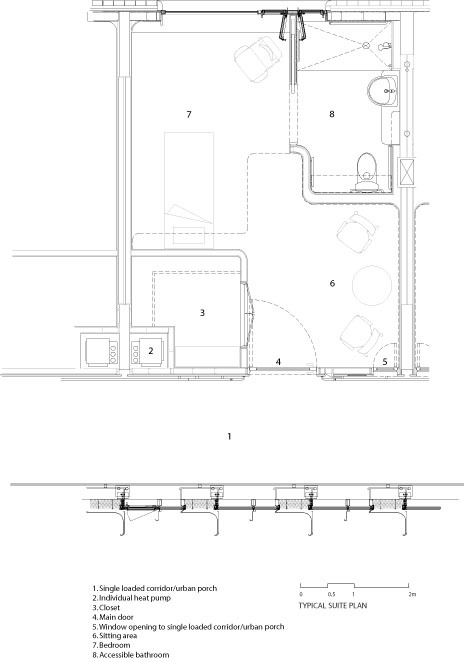 These dualities are articulated both in the exterior of the building and the spaces within. 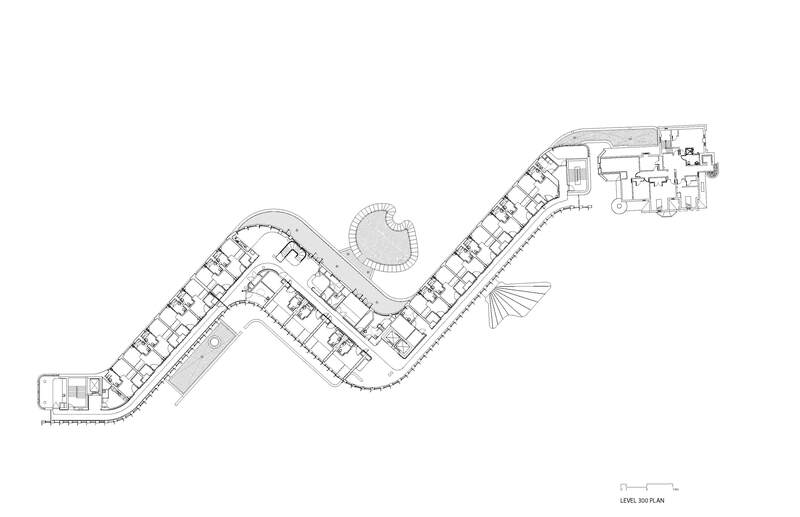 The design of the new residence for the Sisters is organized along a single loaded corridor that forms the spine of the building. A series of operable windows line one edge of the corridor admitting an abundance of natural light and natural ventilation through the corridor and into the suites that overlook the verdant ravine landscape. 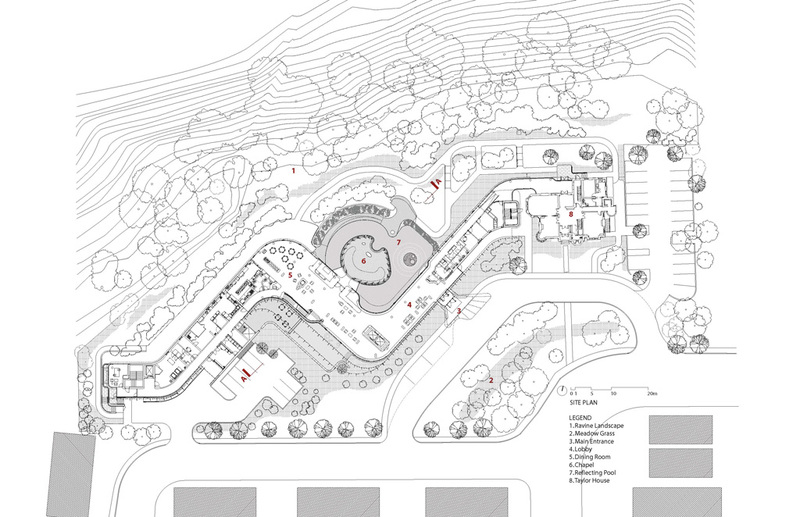 The program for the building includes 58 residential suites accommodating a variety of levels of care, from independent living to long term care, nursing stations and associated requirements: chapel, dining and kitchen facilities, meeting spaces, and community rooms. Private rooms are organized along single loaded corridors with suites facing the landscape and light filled hallways looking out to the city. 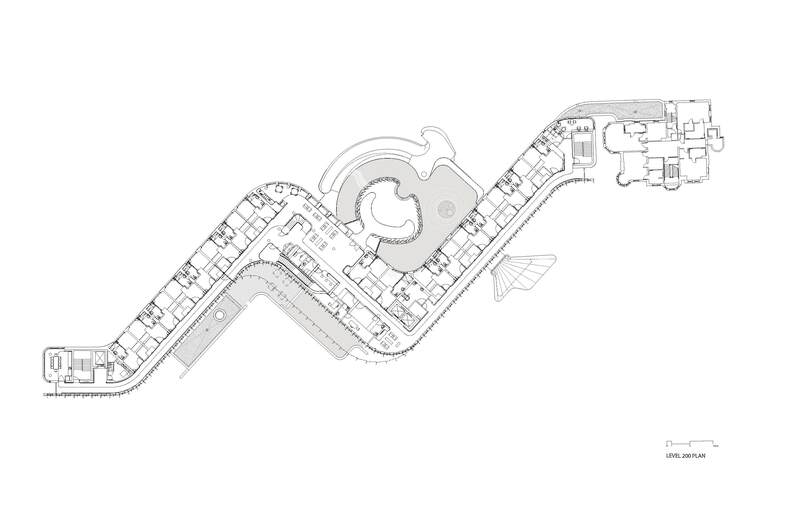 The main communal spaces are located on the ground floor with easy adjacencies to facilitate community spirit. 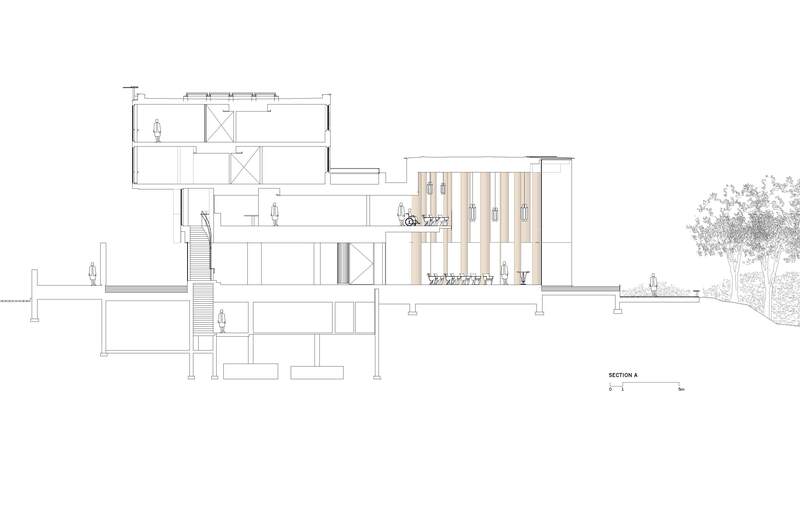 Upon entering, one is immediately aware of the thinness of the building and the views of the landscape beyond. 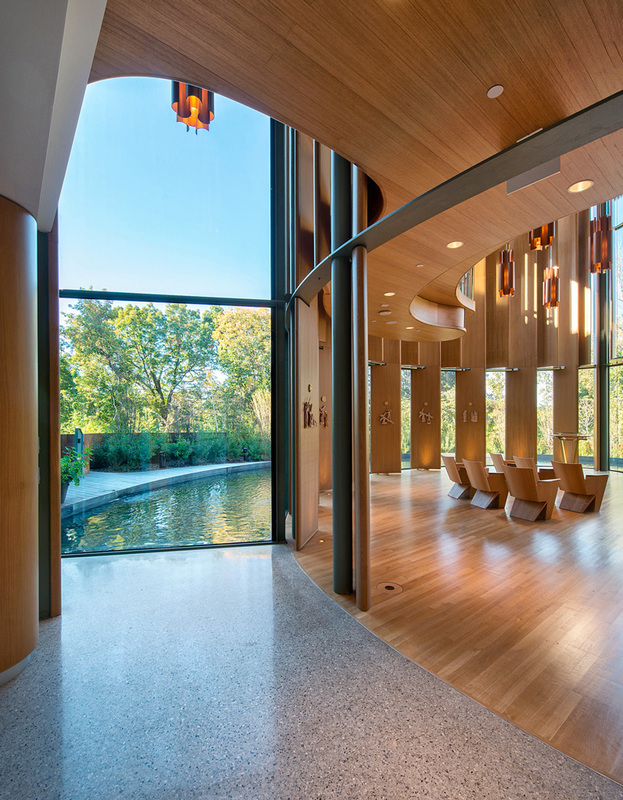 Looking through the lobby, the glazed, organically shaped chapel sits in a reflecting pool and forms the spiritual and physical center of the building. The chapel is clearly visible from the entry and its glass construction serves as a counterform to the brick “body” of the main building. 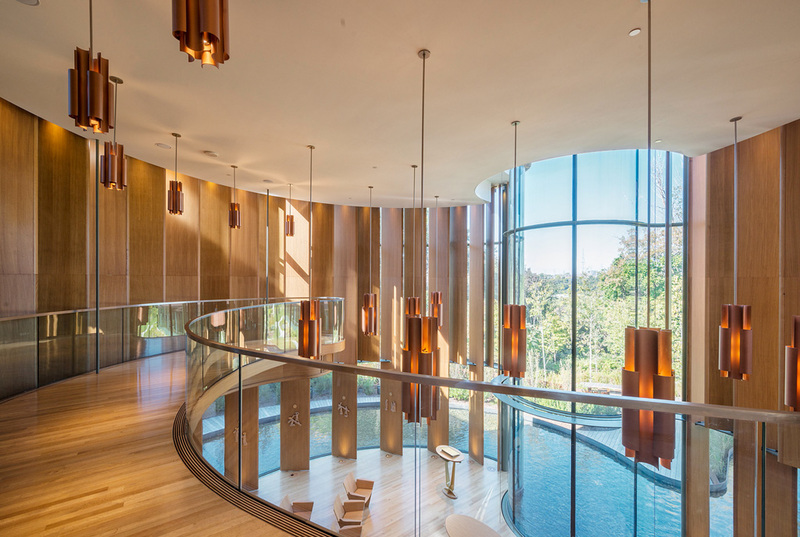 Reflected light from the exterior pool washes across the oak fins, filling the chapel with an ever changing quality of light throughout the day. The adjacent lobby sitting area and dining space are all interconnected to form comfortable areas for communal gathering. 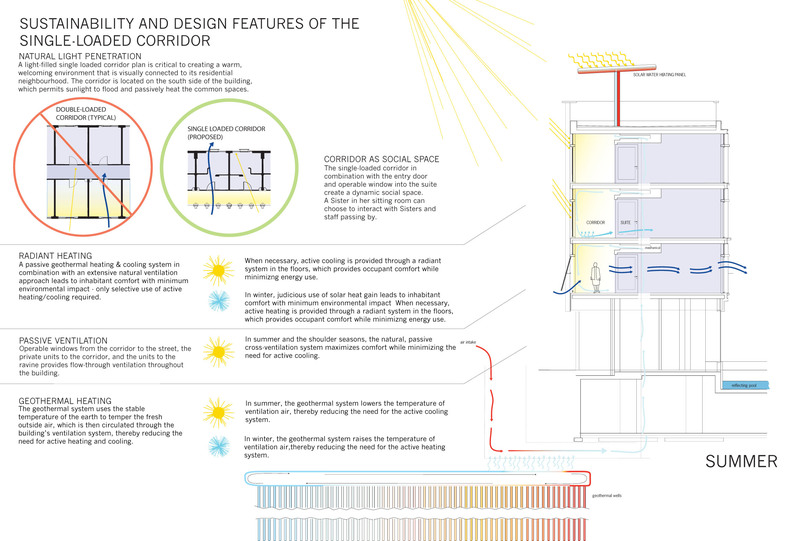 The project aspires to a high level of sustainability for ethical reasons. 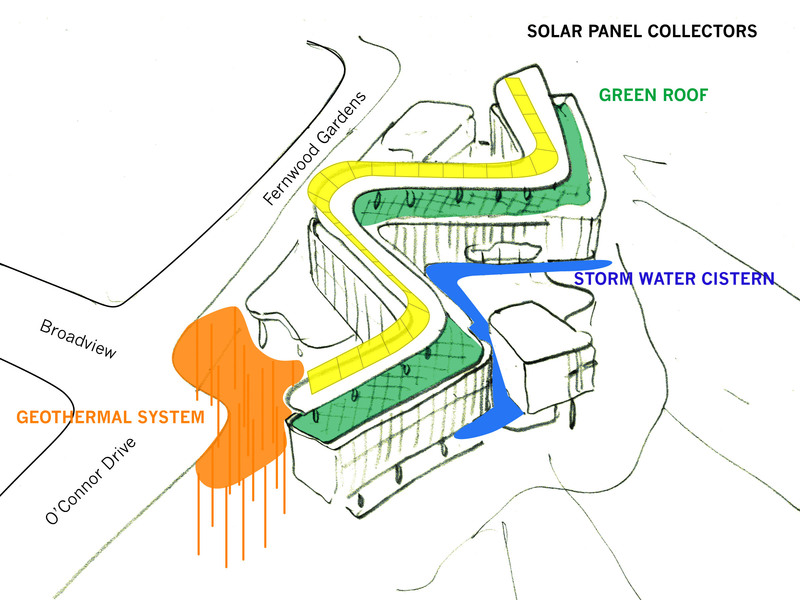 This includes geothermal for heating and cooling, solar preheat for domestic hot water, photovoltaic panels, green roofs, high quality building envelope, bioswales, naturalized landscape, and permeable paving. 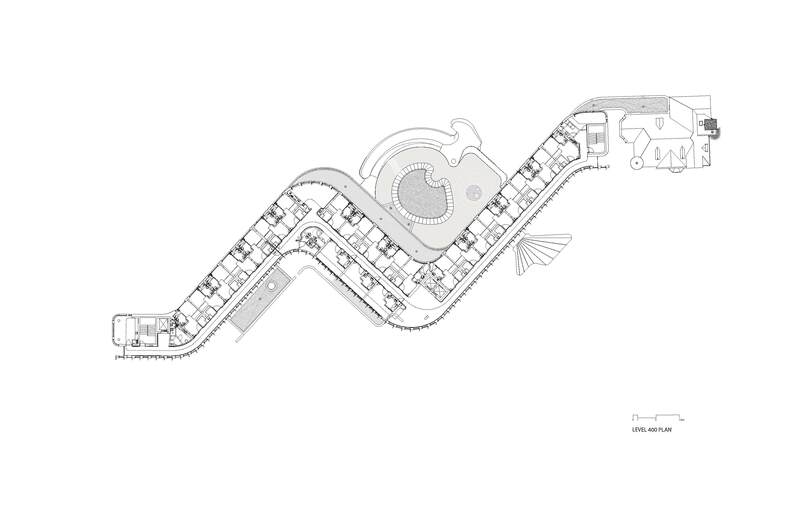 In addition much attention was placed on the residents’ sense of control over their individual environment. 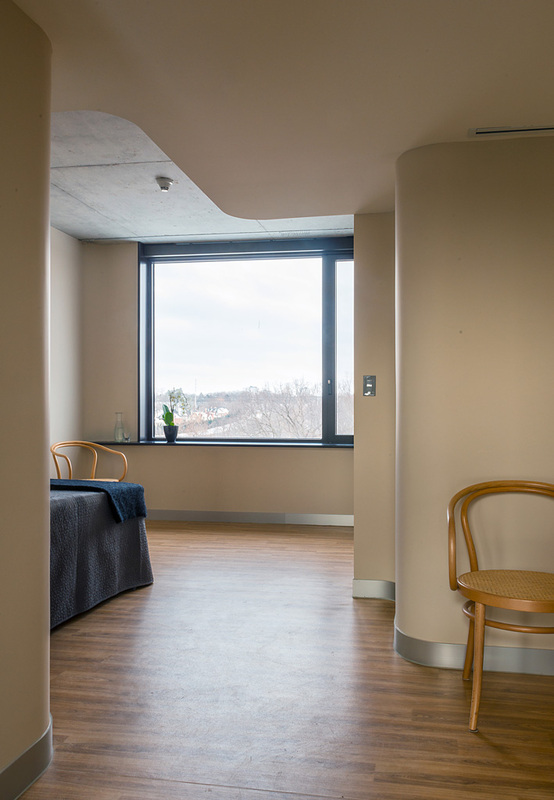 This was facilitated by providing cross ventilation between operable exterior windows in the hall, suite windows to the hall, and suite windows. These windows, coupled with individual heat pumps, give the occupants a high degree of personal control over their physical environment. 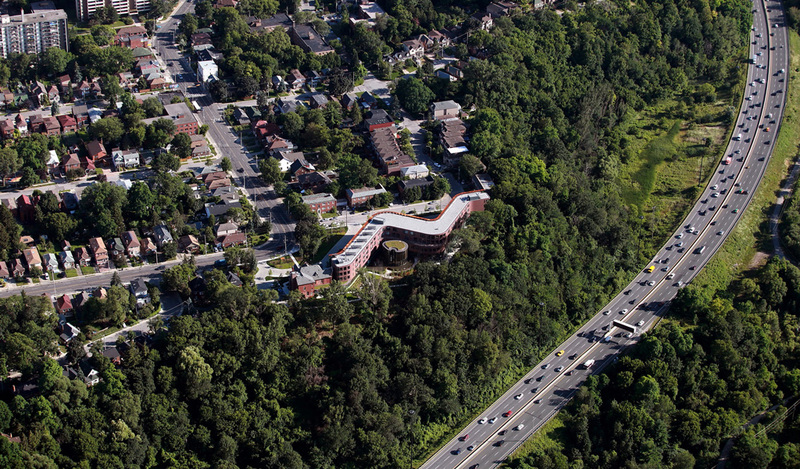 The landscaping for the project mediates between the restored forest of the ravine, the building and the city. 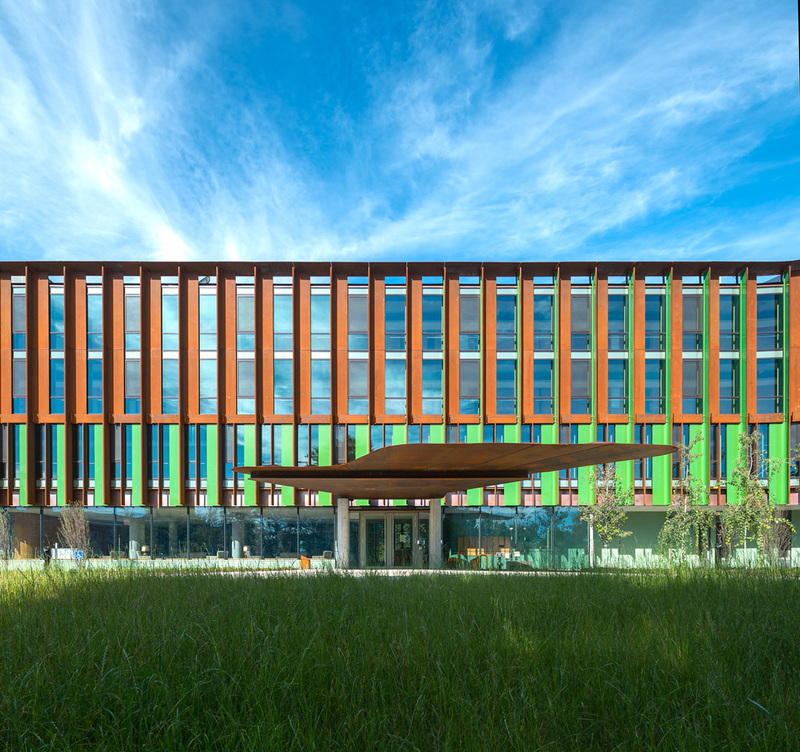 Cor – 10 steel retainers, pathways, decks, and green tile walls act as organic architectural transitional elements while indigenous plant materials are used throughout to create meadows between the ravine and the building with meandering barrier free pathways. 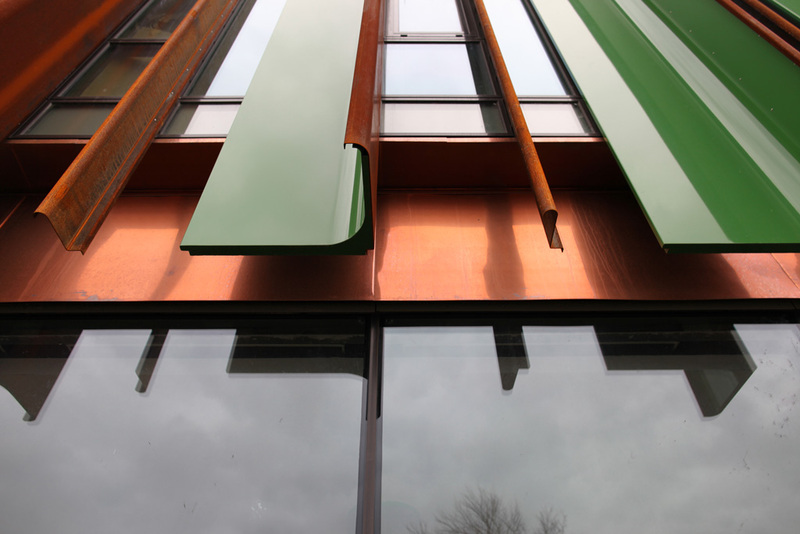 The experience of the landscape from within the building, and from outside, and the buildings relationship to the City, creates a place that is simultaneously contemplative and connected to city life. The individual suites for each Sister serve as a home within a larger home supporting the needs of each Sister while fostering the core values and beliefs of the Sisters. 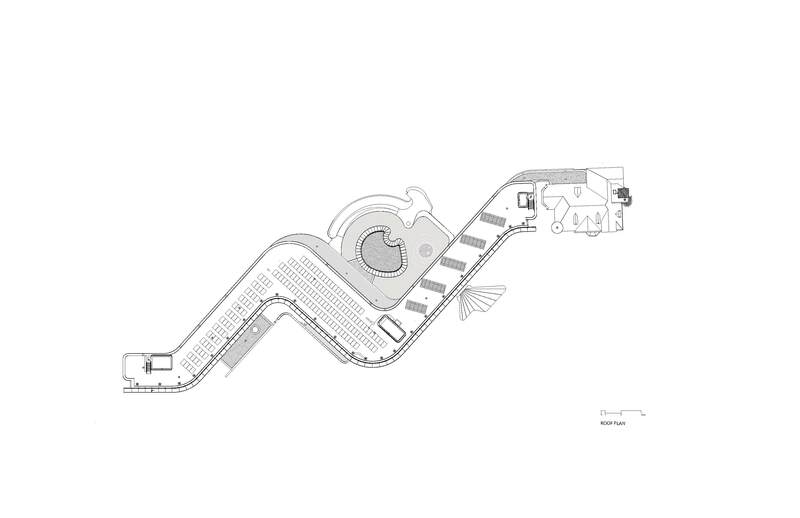 Brigitte Shim and Howard Sutcliffe formed their architectural design practice Shim-Sutcliffe Architects in 1994 reflecting their shared interest and passion for the integration and interrelated scales of architecture, landscape and furniture. Shim-Sutcliffe’s work straddles public and private commissions for sacred spaces, public parks and landscapes as well as institutional and residential projects. Shim-Sutcliffe has redefined design practice by intertwining light, water and landscape in exploratory and innovative ways. 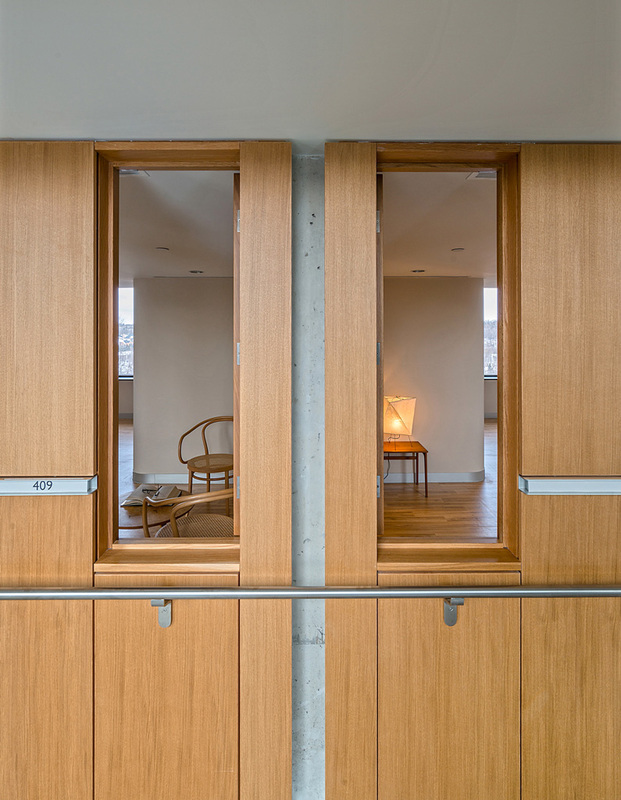 To date, Shim and Sutcliffe have received thirteen Governor General’s Medals and Awards for Architecture from the Royal Architectural Institute of Canada and an American Institute of Architects National Honor Award along with many other professional accolades for their built work ranging from projects for non-profit groups to public and private clients.